Sony and Grass valley have taken different approaches to the 3-chip UHD camera. Several broadcasters are starting to produce sports in UHD. Notably Rogers Media in Canada and BT Sports in the UK have sports channels delivered OTT via fibre that have UHD content. It is early days yet for mainstream broadcast as issues around transmission standards as well as HDR are resolved and future-proof receivers and set-top boxes start to roll out. 2017 looks to see more services launching, but it all starts with the cameras. The popular format for production remains the 2/3 in sensor, B4 mount, but what are the compromises when moving to 4K? When 4K trials for television sports production first started, the directors had to use whatever was available, and that was digital cinema cameras modified to give live outputs. All the usual communications and monitoring that conventional system cameras use had to be added on, and base stations developed to feed the switchers with conventional quad-3GSDI signals. The lenses were fixed focal lengths or very modest zooms designed for cinematography. The cameras had large sensors, and that generally led to a shallow depth of field, with attendant focusing issues when shooting sport. The lenses were designed for operation by a focus puller, not the servo-zooms you need for sports. The sports production companies got to talking with manufacturers about the sort of camera they wanted. Well—it was like an HD camera, B4 mount, long zooms, reasonable depth of field. Ideally it should be equally sensitive as an HD camera, but 4K resolution, oh, and it would nice if it also supported high frame rate and wider colour gamut. Broadcasters have existing stocks of expensive B4-mount HD lenses with years of life left before replacement. Smaller depth of field with super 35 lenses makes focusing a challenge for fast-moving sports. Directors are used to using long zoom ranges up to 100:1. Super 35 zooms have limited ranges with 10:1 being typical. 3-chip cameras would be expensive, with a larger prism and the associated sensor costs. Large sensor cameras instead use a single sensor with a Bayer colour filter array (CFA), which means a 4K sensor is not 4K resolution. 6K or more photosites are needed to achieve 2000 TV lines resolution. Add to that the optical low-pass filter (OLPF) that controls spatial aliasing must be a compromise between the green and the red/blue sensor grids with the R/G/B/G array (effectively 4:2:2 sampling). The answer was a new line-up of cameras that are generally based on the traditional prism beam-splitter, 3-sensor format. There are exceptions, Panasonic have a single sensor camera, and Hitachi a four sensor (see below). This new round of cameras are all designed for with the industry-stand B4 lens mount that is used on existing HD cameras. In contrast, the cinematography cameras have opted for the PL mount. A 2/3” 3840 x 2160 sensor has a pixel size of 2.5 x 2.5µm, an area of 6.25µm2. Contrast a 1920 x 1080 sensor with pixel size 5 x 5µm, an area of 25µm2, which is of course four times the size, and gathers four times the light for a given exposure. All things being equal, a 3840 x 2160 sensor is two stops less sensitive than a 1920 x 1080 sensor. Much of the constraints are down to the laws of physics. The relation between lens aperture, sensor size, depth of field, lens diffraction, all follow the laws of optics. The noise floor of the cameras is limited by quantum effects like photon or shot noise. You can’t design you way around the laws of physics with more processing power or smarter algorithms. Of course the camera designers all have their secret sauce to minimise the visibility of noise, especially in the shadows, but the designers are really bumping up against physical constraints in the latest line-up of UHD cameras. The other constraints are practical. Premier stadia may be lit to levels of 2,000 lux, but minor leagues may have only 1,000 down to 500 lux of floodlighting. So asking for more light to balance the loss in sensitivity is not going to happen. The fallback is to increase the gain, but that does make for noisier pictures. The compromise is to continue with 3-chip, 2/3”, B4 format for general studio and field cameras, with the super 35 cameras used when appropriate for the production. The drawback to the compromise is reduced sensitivity for 4K pictures. When super motion cameras are used, the sensitivity decreases as the exposure shortens so increased gain has to be used with attendant picture noise. High frame rates and high dynamic range all challenge the sensor designer. The different camera vendors are cognisant of the financial pressures on mobile production units. For the next few years 4K will be a niche area, with the majority of remote productions being in HD. Early 4K sports channels have been telcos looking to promote high bandwidth OTT services, like Rogers in Canada, and BT in the UK. Over-the-air waits for new broadcast standards to launch with HEVC compression. This reality means that the cameras must be equally usable in an HD environment, being ready for UHD when it becomes mainstream. That way investments today are protected for the 4K future. This is a round-up of B4 mount cameras that can be used with existing HD lens stocks. Panasonic's UC3000 uses a large format sensor with a relay lens to match the B4 lens mount to the sensor. 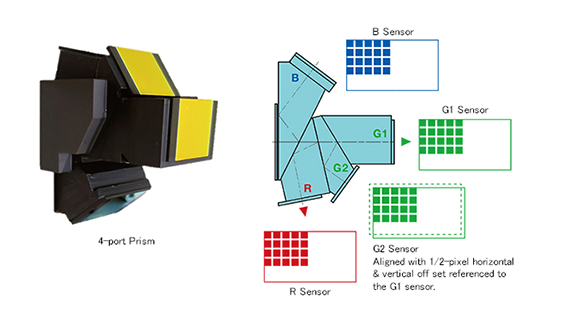 This design allows regular B4 lenses to be used without the cost of three precision-aligned sensors and the splitter block, and gives the improved sensitivity of the larger sensor. The single 11 megapixel CFA sensor output is processed to the 3840 x 2160 raster UHD output. Most UHD studio and field camera designs have continued with the familiar prism and 3-chip model of HD cameras. Grass Valley offers two approaches: HD upconversion for highest sensitivity, or native UHD for highest resolution. 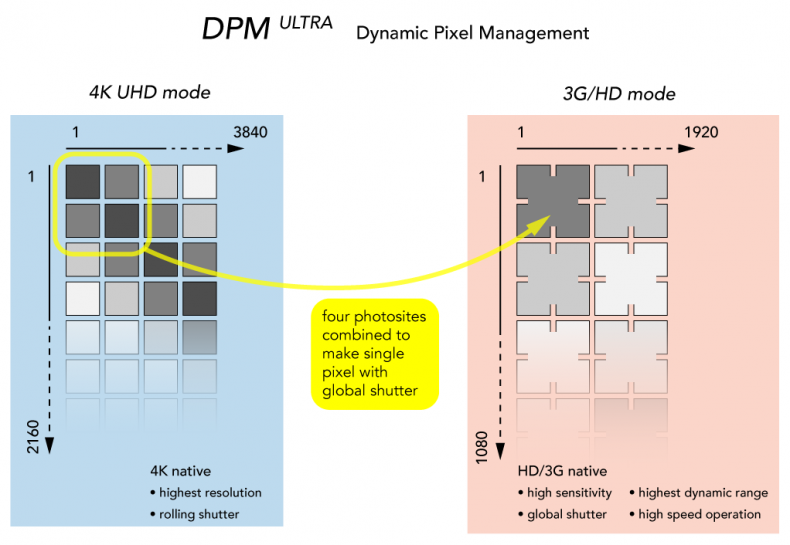 Their new 4K sensor uses a unique feature called DPMULTRA (Dynamic Pixel Management), which allows four photosites to be combined to a single pixel for HD operation. The individual photosites have a rolling shutter, but when the sites are combined for HD operation, the summing circuitry includes a global shutter. The OPLF is changed for 4K or HD operation using the filter turret. That way the correct spatial anti-aliasing is used for the sensor resolution. When shooting UHD with an HD sensor for the best sensitivity, the camera circuitry upconverts the RAW R:G:B 1920 x 1080 signals to 2060P before colour sub-sampling to 4:2:2 and applying processes like contours (aperture correction or sharpening). In a recent conversation with Klaus Weber, senior product manager for cameras at Grass Valley, I learnt about their research into sports production. 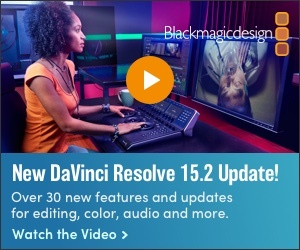 They recommend that RAW upconversion gives best results for use with long range zoom shots, player close-ups and the like. Whereas wide shots of the field of play benefit from a native 4K sensor. Grass Valley uses Dynamic Pixel Management to allow the user to switch between 4K and HD at the sensor. The Ikegami UHK-430 system camerafeatures three 3840 x 2160 sensors. A built-in 40Gb/s optical transceiver enables full bandwidth of 4K resolution signals transmission between camera and CCU supporting full colour space in 4K, RGB 4:4:4; to create high quality chroma key signals. The block and lens mount can be detached and used up to 50m from the camera for operation on rigs and cranes. The company promises the possibillity to swap the optical block to an optional assembly which could be a super 35mm 4K sensor or high frame rate sensor for a future proof design. This upgrade is slated for 2017. Sony leveraged their expertise in sensor design to launch their first three-sensor UHD camera with only a slight loss in sensitivity over HD cameras. The HDC-4300 has three 3840 x 2160 sensors with a newly designed prism, which supports wide gamut 2020 capture. The camera is designed to be used in 2160 or 1080 productions. With the 4K option enabled the camera can output 2160p up to 60fps. In HD cut-out mode the camera can output high frame rates, avoiding the need for special slomo cameras. As an option, the camera can shoot up to 480fps at 1080P. Note that the Sony HDC-4800 high-frame rate camera is a single super-35 sensor, PL-mount format. Unlike the cinematography cameras this is a proper broadcast system camera designed for live production. The 4-port beam splitter in the Hitachi UHD4000 presents a novel approach to balance sensitivity and resolution. Hitachi has taken a novel approach with the UHD4000 4K camera. They use 1920 x 1080 sensors, but use two green sensors, offset by one-half a pixel vertically and horizontally. This effectively sampling the scene 4:2:2 at 4K resolution. As the 5µm photosites overlap, this is not achieving a true 4K resolution, but it is higher than a 1920 x 1080 sensor. 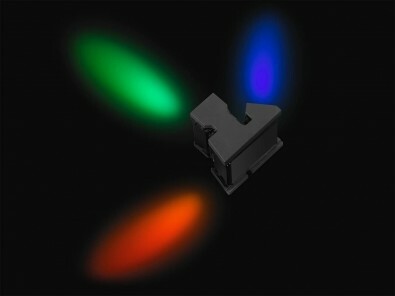 The 2-way beam splitter in the green path means each green sensor is receiving half the light of three-split prism.